Currently-registered (enrolled or auditing a current or future course) students can charge eligible bookstore items, sales tax, and shipping costs to their accounts. This lets them purchase items and pay for them alongside their tuition and fees. Purchased Bookstore items become Bookstore charges. Tax and shipping, if you let them get charged to account, are tied to Fees. Bookstore charges are automatically eligible for financial aid. Tax and shipping fees must be marked aid-eligible when you set them up. Both kinds of charges initially become pending charges; after a financial user invoices them, the student can pay them alongside tuition and fees. Tax and shipping: To charge tax/shipping to account, you'll need to first set up associated fees in Billing > Settings > Fees (you may need to ask a Financial Admin user to set these up for you). Bookstore items: When adding or editing an item/segment, check whether it can be charged to account. With these settings in place, students will be able to charge bookstore purchases to their accounts. Assemble the order as normal. Look up the student by name or student ID. Check the individual items to be charged (including, if you've set it up, sales tax); you can also just click Charge all to account to check all items and the tax. Select the term in which these charges will be applied. If there are any items which cannot be charged to the student's account—or if the order total exceeds the student's charge-to-account limit—you'll also need to take payment for the remainder. As soon as you complete checkout, the items you charged to the student's account appear under Pending Charges on her Profile > Financial > By Term view. It is then up to a financial user to invoice those charges and collect payment for them. Students can also charge items to their accounts using the online shopping cart. The student must log in with his Populi username and password in order to charge to his account. 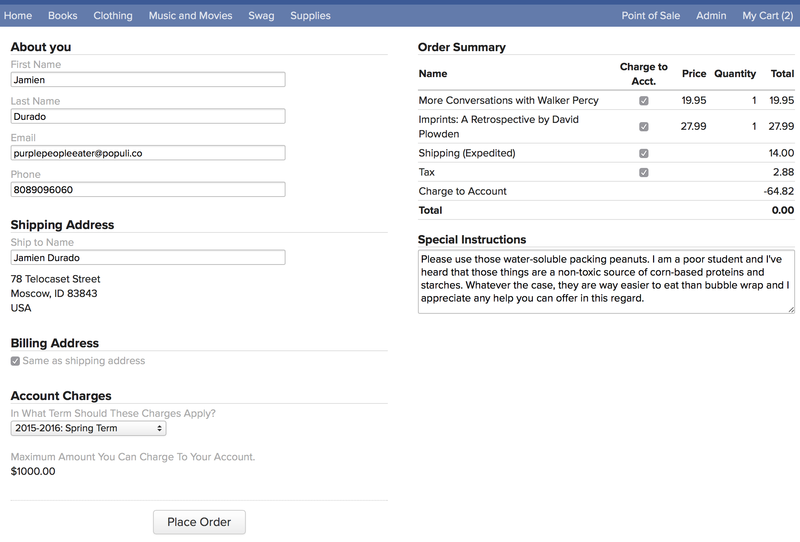 When the student completes online checkout, he can charge the items to his account on the payment screen. When you mark his pending order as ready to pick up/ship, the items appear under Pending Charges on her Profile > Financial > By Term view. How does the charge to account limit work? You set up a $500 charge-to-account limit. A student charges $100 on an online order and later charges another $150 on a point of sale purchase. That leaves him $250 on his Charge to Account limit. The student makes a $4,300 payment.